Many startups struggle with sales because founders don’t want to sell an imperfect product. But, products can’t be improved without customer feedback. Plus, the product will never be perfect – we’re in an endless game of optimization where a single feature won’t make or break your business. What’s more, many founders aren’t salespeople and have little sales training. But, as long as you’re motivated, believe in what your product or service can do, and are ready to hustle, you can (and should) become a great salesperson. Ramping up a good sales pipeline isn’t only for startups that are bootstrapping. A robust pipeline of business is also one of the fastest ways to a potential investor’s heart. So how do you sell your product or service early? You stop worrying about getting it perfect and you start worrying about how it can benefit your potential market. Means benefits – These are typically action words or verbs, and they describe HOW your business does something to help clients or customers. End benefits – These are the RESULTS or EFFECTS that stem from the actions mentioned as means benefits. For example, let’s say your SaaS product helps business owners predict brick-and-mortar locations that will be successful. These accurate predictions help your clients increase profits by 200%. Accurately predict successful locations is the means benefit. And, clients increase profits by 200% is the end benefit. Note there’s empirical evidence there – people love numbers. Guess which one your potential customers care about? Ends benefits, because humans care about RESULTS. So when you’re jotting down the benefits of your product, make sure you add ends benefits. When you’ve got excellent, results-oriented benefits to share with your prospects, you’re not selling your imperfect product, you’re selling the VALUE of your product. One of the best ways to gain the trust of your prospects is to show them proof that your product or service is valuable. Do this by asking current clients for testimonials. At the top of the funnel, you’ve got the folks who might be interested in your product/service, but they are merely aware of your company. They might have become aware through marketing material or from a sales introduction or message. In the middle, you’ve got the prospects who are interested and qualified: Meaning, they can benefit from your product and therefore might be interested in purchasing. At the bottom, we have the people who are likely to buy. This might include prospects who’ve asked for a proposal or who are on the buying page of your website’s digital funnel. Digital funnels are owned by the marketing department, but can occasionally require assistance from the sales team, depending on the company and its process. Each business has a different sales funnel depending on their sales cycles and sales processes. A sales cycle or sales process is the pattern(s) used to turn a prospect into a buyer. You’ve created something you believe in, and you’ve got the MVP version ready to sell. Many founders don’t know where to start, but you’ve gotta start somewhere. Remember: You don’t need a perfect product if you’re selling excellent results. Which department does your product benefit? Is it HR, is it the engineering team? Who is the decision maker in that department? Is it the Marketing Director? Is it the CEO or Financial Chief? How many people work at your ideal company? Are you selling to startups or to mid-size or fortune 500 companies? What is the value or annual revenue of your ideal company? Companies need to have the budget for what you’re selling. Getting clear on who you need to target will help you find those targets. Once you have an understanding of who you need to target, then you’re ready to start reaching out. LinkedIn is a great place to start because you can filter by company size, title, and so on. Make a list of the people you want to reach out to and tailor a great sales message for each prospect. You can create successful cold email templates in the same way that you tailored your messages for LinkedIn prospects. You can use tools like hunter.io to help you find emails for your ideal prospects. Tip: There are tons of companies out there that will supply you with thousands of emails, phone numbers, etc. but these lists are often outdated and full of wrong info. You can avoid this pitfall by building your own lists and scaling your efforts over time. You can hire affordable and experienced freelancers on Upwork to mine contact data. Sales and marketing teams should be aligned with the same set of goals. Each team has a different way of reaching customers. 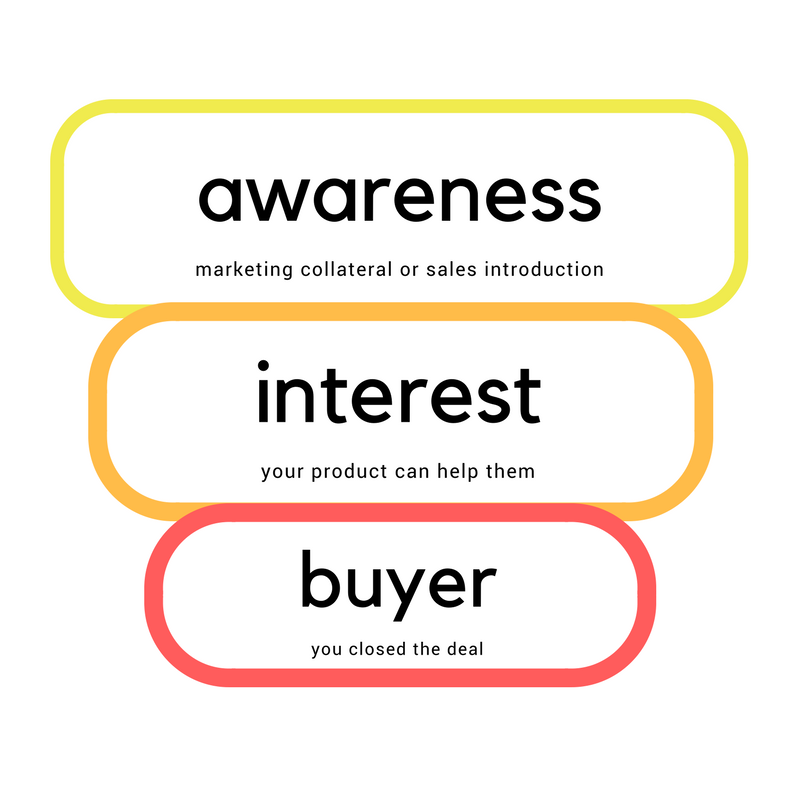 Marketing helps with building awareness, and early stages of relationships before prospects are buyers. Sales teams move aware prospects down the funnel and close deals. Example: The marketing department publishes a blog post and gets 100 new email subscribers from the post. Those emails are then transferred to the sales team’s CRM so that they can begin sending intro emails to those potential customers. Without goals, there’s nothing for you and co. to aim for. So you’ll want to have a solid sales plan in place with appropriate sales goals for you and your team. So how do you create a sales plan? Step 1: Define reasonable goals – Reasonable goals are reachable, yet big enough to increase the company’s profit each quarter. To set a realistic goal, consider how much selling you’ve done as founder to land a certain amount of business. How many deals have I closed in the last six months? How much were those deals worth? How many meetings (or calls, presentations, proposals) did I have to give to close those deals? How many cold emails, referrals, etc. did I have to send to generate that number of meetings, presentations, or proposals sent? Once you’ve got an understanding of how much you were able to accomplish, you can set a bold, yet realistic goal for the team. It required 100 meetings to close 50 deals (You closed 50% of your deals). It required 300 cold calls to get 100 meetings. So to set an appropriate goal, we might suggest that each teammate be responsible for 100 cold calls, emails, or referrals each month. That should mean we can achieve around 50-100 meetings per each team member per quarter. And if we have a 50% close rate, then each person should close 25-50 deals, bringing in about $500k+ in 6 months, or $1MM yearly. Every rep on the team should bring in $1MM yearly. Each rep should make 100 cold calls per month. Step 4: Measure success with KPIs: You can’t improve what you don’t measure. In sales, measurements are called KPIs (Key Performance Indicators). We keep track of our contacts and sales efforts inside CRM (customer relationship management) software. You can do some research on the best CRM for your needs. They’re all pretty user-friendly these days, and HubSpot offers a free CRM if you’re on a tight budget. Let’s say we begin measuring KPIs within our CRM and discover that generating referrals is more profitable for our business than making cold calls. Therefore, you might decide to have sales reps focus on referrals and change the cold call tactic. You might change the tactic to “make 50 cold calls per month and generate 50 referrals”. Step 5: Optimize based on results: Take a look at the data in your CRM every week. If calls are working better than emails, then do more calling and less emailing. If having a conversation about a proposal instead of just sending one via email works best, then have that conversation with each prospect. You can also use KPIs to see which teammates are hitting goals and which aren’t. This will help you provide better training and make smarter decisions about your people. It’s important to incentivize sales people with commissions, bonuses, and rewards. This keeps the team motivated, on track, and excited about something bigger than a quota or number in a sales report. Hiring good sales folks is no easy feat, especially if you don’t have much sales experience under your belt. But have no fear, like anything else these days, a paid trial period can help you find the gems. Trying to save money on hiring a salesperson isn’t the best decision. Salespeople make good money, especially those with SaaS and tech sales experience. So, you’re not going to get a unicorn when you’re paying peanuts. You’ll get an entry-level salesperson. Entry-level is fine so long as you’ve got the time and means to train them. Hiring a consultant can be a great thing, or not. Consultants can be helpful when it comes to sales because they’re more experienced, they work faster, and it’s not as expensive as hiring full-time talent. On the other hand, do your homework and make sure you’re hiring a good sales consultant. Trial periods work well here too. Salespeople are charming. If they want the job, they can convince you that they’re the best person for it. Be aware of this when interviewing, and as stated above, have a trial period. Sales is one of the most important facets of startup success. Besides investment, it’s where your money comes from. Make sure you’ve got a solid plan and process in place so that you can continue to improve growth year over year.